Finally, someone developed a game with a hero worth fighting for. Forget Lara Croft, I'm talking about a humble pint of lager. 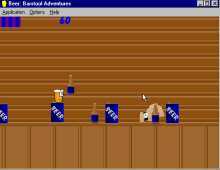 Beer: Barstool Adventures is a fun little freeware game that casts you as a beer mug (yes, a beer), and pits you against thirsty barflies and ravenous rats. There are eight challenging levels to battle through, all of which are very different from one another (similar to the mini games in Alley Cat). After you get used to amateurish graphics, the game becomes strangely addicting. The first level is simple. You must race across a crowded bar top, collecting bottles before you are gulped down. The second level has you trying to grab a hammer for some unknown reason. The third level was the pub equivalent of my waterloo. You must advance to a tap by dodging a projectile-throwing rodent. And that's only just the beginning-- the game gets much harder from there. Controls are very simple: if you use the keyboard, press the arrow keys to navigate and the Shift button to jump. In addition to cool gameplay, Beer: Barstool Adventures also features some very nice MIDI music. See if you can guess the opening track (hint: one of the best rock & roll female singers this decade ;)) As far as one-man, freeware action games go, Beer: Barstool Adventures ranks up there with the best. Thumbs up!